If your a regular reader you will know that I'm not great at packing light, but I think I was quite reserved. This is what I took for one night so that's why I didn't take stuff like a mask. I love Soap and glory so when I received a box with some mini's in for Christmas I knew they would be perfect for travel. All three of these products have the original Soap and glory scent, which I really love. The Righteous Butter is lovely and moisturizing and sinks into the skin really quickly. Clean on me is a great shower gel which foams up really well and The Scrub of your life is nice and gentle so perfect for everyday use. For cleansing and makeup up removal I took the Botanics softening cleanser to remove my makeup and then the No7 beautiful skin hot cloth cleanser to remove anything that was left behind on my skin. I don't know about you guys but i'm a complete and utter sucker for lipstick, I just love it. 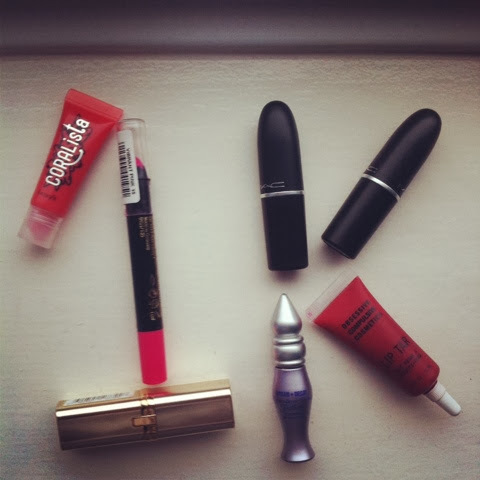 But my school don't so today I thought I'd show you some of the lipsticks I reach for on a regular basis. So first off has to be one of my most worn lipsticks and it's Seventeen Mirror shine lipstick in Beehive. This has to be one of the most hyped drugstore lipsticks in the blogging world and I can see why, it's the perfect mix of pink and peach with a gorgeous glossy finish. Next up I chose another of my favourite lip colours and it's the Collection cream puff in Cotton candy. This is a really beautiful muted rose colour and I love the fact that it's matte but not drying. The third colour I picked is a darker colour and it's MAC brick'o'la. This is a terracotta light red colour but I find it can be sheered out with a lip balm over the top and it looks nice and natural. The final lipstick I chose is my old trusty Natural collection Rosebud. This was the first lipstick I ever bought myself (forgetting ones i'd been given and one's I got in magazines) This is a very similar colour to the Collection cream puff but it's a little darker. I also love the finish it reminds me a lot of Mac's amplified finish as it's the perfect mix of matte and gloss. I hope you enjoyed this post and found it helpful, let me know what your school/natural lip choice. I may be a little late doing this but when the lovely Lauren from Beauty division tagged me I just knew I had to do it! A: Mua power pout - Justify / Mua lipstick - Shade 16 Nectar / The #Bigblogmasproject / Collection cover and go foundation / What I got for Christmas 2013! A: I think I'd have to say my #Bigblogmasproject post as I'm just so surprised I managed to achieve what I did during that project. A: I would just like to work on the quality of my posts, I'd also like to have my blog design revamped but I'm not sure whether I will be able to due to costs so I'd love you guys to leave some reasonably priced blog designers below. A: I'd have Sandra from The Black Pearl Blog not only is she so stunningly beautiful so are her photos and her content and just her blog in general! A: I like to post 3 or 4 times a week but I've been finding that a little difficult at the moment due to having to hand in my first final piece for art! 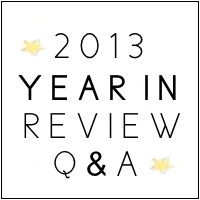 A:My first post of 2013 was a list of Beauty resolutions, it's Here if you'd like to read it. A: I should be packing an overnight bag oopps! A: I've loved talking to all the lovely people in the blogging community and I'm hoping I can meet some of you this year! Recently I have become completely and utterly obsessed with dark and vampy lipsticks and this is just the cherry on top of the very beautiful cake. Mac rebel is a beautiful pinky toned dark purple which looks amazing on a pale complexion although I have seen people with a darker complexion also rock this one. I love the formula as it just glides onto the lips, and is opaque in one swipe. I find you can sheer this down if you want a hint of berry or you can build it up to look very dark. I really adore this lipstick, and I highly recommend it to anyone who is looking for a berry lipstick! Nothing much exciting has really happened this week, I think I may have finally got back into the swing of getting up for school, although my blog is suffering a little in favor of homework and other school related stuff. In social media news I hit 1000 instagram followers after a good 3 weeks at 997 which I was sooo happy about. If you guys would like to follow me I'm at Theperksofbeingacoleeeyyy ! I also made a big decision this week and finally after months of debating I have decided to make a YouTube channel I posted a quick channel trailer mid week and hopefully I will get a proper video up for you guys some time today. If your not subscribed already then you can here, I'd also love for you guys to leave your YouTube links down below so I can subscribe to some more of you! In terms of music I've been loving Panic! at the disco "Too weird to live, too rare to die" Vegas lights is most definitely my favourite track but I do love the whole album. This week my blogging has been a little sparse but I reviewed the Maxfactor Colour Elixir Giant pen stick Here and my second #2014bloggerchallenge post went up Here. I hope you enjoyed this post, Id love for you to let me know whether I should keep doing these kind of posts! I am completely in love with this, first off can we just admire the colour of it! I bought this on a complete whim after reading no reviews, and i'm so glad I did. As you can see it's a super bright blue toned pink. I love the glossy finish but to my surprise despite it being so glossy it lasts for a good 6 hours which for something so bright really impressed me. I find the formula perfect and the colour glides on to the lips, I also find it very easy to be precise with. The only thing I don't like about it is the fact it has to be sharpened although the lady at the Maxfactor counter said it is easier to sharpen if it has been in the fridge overnight. I would 100% recommend these and for £6.99 they are such a bargain. So recently I won a giveaway over on the Lylia rose Facebook page Here and I thought I'd show you what I won. I love this one it looks really pretty with plain clothes and just's add's a little something to your outfit! This one is so cute I love the detail and it looks so cute with dresses. I can't actually find this one on the website so I have no idea of it's name or price. Which is typical as it's my favourite one. I love how dainty it is and I think it will look so cute in the summer. So that's what I got, the Lylia rose have some amazing giveaways over on their Facebook page here. I'd also highly recommend checking out their shop as they have some gorgeous pieces here. Could I be any later to the band wagon with this one, probably not but when I asked on twitter you guys said you'd like to see a review so here it is..
Now I'm fully aware that I am a horrible blogger as I used this before I photographed it oops! I will one day stop committing such sins. Sin - A super shimmery metallic baby pink. Naked - One of the two matte colours in the palette, a muddy light brown. Sidecar - Very similar to sin but a more brown'y pink. Buck - The other Matte in the palette, a mix of grey and chocolate brown. Sidecar - A gold shadow packed with shimmer. Smog - A dark brown with particles of gold shimmer, this can look a little more on the olive green side in certain lights. Darkhorse - A very dark chocolate brown almost black with lots of shimmer. Toasted - Probably my favourite shade out of the palette a mix of brown and pink packed with shimmer. Hustle - A very warm shimmery light chocolate colour. Creep - The most disappointing shade in the palette for me it's just not as creamy as the rest, a black with rainbow shimmer. Gunmetal - Another of my favourite shades, a beautiful navy blue with silver shimmer. Overall I really love this palette and I find I can get a really varied array of looks out of it. The shadows are amazing quality and blend like a dream. Now I just need the other two naked palettes! Onto the look I created with this palette, it isn't one of the most subtle looks you can get out of this palette but I think it's my favourite look I've produced so far. So for my base I used the Urban decay primer potion and a little bit of Mac Bare study paint pot. I then applied Half baked all over my lid using a fluffy brush. I then popped Smog in the crease and blended it all together. Then I took Darkhorse on a small brush and ran it under my eyes. I put a little bit of Creep along my top lash line, highlighted with Venus and finished off the look with Benefit's They're real mascara! I hope you enjoyed this post, Do you like reviews and looks together or would you prefer me to do them as two different posts? I am completely head over heels in love with this polish, it's the most perfect mix of glitter, glitter and even more glitter. This polish is tiny particles of green and silver shimmer and larger hexagonal lighter green glitter suspended in a deep green metallic polish. It's completely opaque in 2 coats and lasts 3-4 days on my nails. The only problem I have with this is removing it, lets say it takes a hell of a lot of elbow grease! Other than that this polish is completely perfect. It's such a stunning colour and I will be picking up more shades from this collection!